This is an unusual but thoughtful coupling of two well-loved concertos, and for all the importance of the soloist on the disc cover, I think the plaudits are fairly evenly shared between the violinist and the orchestra. The BBC Symphony Orchestra has a well known pedigree in Elgar, and you can sense that heritage in the authority they bring to the orchestral sound. The opening tutti of the Elgar concerto, for example, is brilliantly assertive, thanks in no small part to the contribution of Andrew Litton, of course, and to the clarity of sound achieved by the Avie engineers which manages to make the work breathe from within. The orchestral sound always has a sense that it knows where it’s going, but also that it can stop and enjoy the view when it wants to. The first movement’s second subject, for example, has a lovely amount of space around it, breathing sweetly in its clarinet solo, and the strings are wonderful at the opening of the slow movement. There is also just enough presence in the eternally strange accompanied cadenza. In fact, the importance of the orchestra is one of the key features of this recording. So, too, is Andrew Litton’s conducting, which has a lovely way with the drama and what feels like an intrinsic understanding of the work’s structure. He understands the forthright nature of the first movement and unfailing lyricism of the Andante, but he’s at his best in the finale which, in some hands, can run the risk of sounding patchy or episodic. Not here: every twist and turn feels organic and well controlled, making every nuance count, be it in the hyperactive violin leaps or the more lyrical slower episodes. Barton Pine herself showcases what she can do very impressively. Interestingly, however, she seeks to eschew effects and fizz for thoughtful lyricism. The violin’s first entry, for example, is deeply lyrical, making the most of the throbbing low tessitura, a pulse of energy surging through the beat. That low register also comes into its own when the second subject of the slow movement appears for the first time, showing that she is an uncommonly thoughtful violinist. There is dazzle aplenty, but it’s effective because it is largely saved up for the finale, which had me repeatedly smiling at the sparkle of what she managed to produce. She also achieves the most wonderful effect as the violin dissolves back into the orchestral line at the end of the cadenza, and the coda has just enough of a swagger to send it boldly over the finishing line. My previous touchstone among recent recordings of this work has been Tasmin Little’s recording with Andrew Davis and the RSNO (review): this one doesn't quite replace that, but it gives it a run for its money. 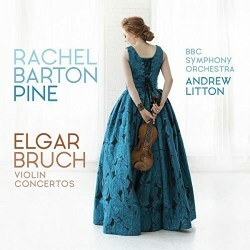 It’s more difficult to place the Bruch recording in the pantheon, simply because there are so many more recordings in existence; but this one is very good nonetheless. The violin is a more strident, almost operatic presence in the first movement, but that stops it becoming a mere prelude, and the outpouring of melody in the slow movement is rich and seamless. The quiet playing is particularly ravishing, and that stands in contrast to a finale that is rumbustious and light-hearted, kicking its heels and flicking up sparks in its good humour. The documentation is good, including an essay from Barton Pine herself, and, as I hinted above, the Avie sound is super. All told, then, a very successful pairing, both of works and of artists.